TWO men have been lucky to survive a serious accident where a 4WD rolled 25 metres down a rugged embankment near Hernani, north-west of Dorrigo. The vehicle, believed to a troop carrier, hit a pothole on a remote fire trail and rolled down the steep hillside, crashing into a tree shortly after 9am today. Both the driver and passenger were injured after they were ejected from the tumbling vehicle. Emergency crews said the 47-year-old driver was able to climb to the top of the embankment and alert emergency services. Paramedics said he did so while suffering extreme pain from neck, back, leg and abdominal injuries. 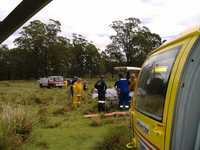 His mate, a 36-year-old man, lay injured at the base of the hill, suffering back, leg and head injuries. As rescuers raced to the scene, the man is said to have drifted in and out of consciousness. Police said grave fears were initially held for his well-being given the remote location of the accident, off the Marengo Road, about 40 kilometres from the Armidale Rd intersection. Officers from Dorrigo and Coffs Harbour responded along with paramedics, local Rural Fire Service crews and the State Emergency Service. 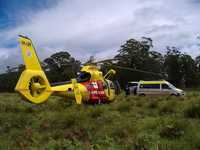 After crews arrived on scene a decision was made to task the Westpac Life Saver Rescue Helicopter to the location. Air crewman Jimmy Keough said the helicopter touched down on top of a steep incline near Chandlers Creek in the Chaelundi State Forest. “The crash scene was inaccessible by helicopter. 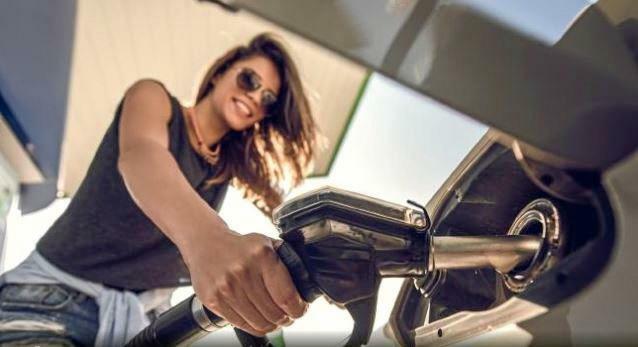 Initially we thought about winching in but the decision was made to land the helicopter about two kilometres away due to the location being so heavily forested and remote,” Mr Keough said. 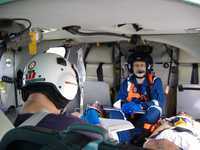 The helicopter’s doctor and paramedic were taken to the scene by ambulance crews and the two patients were stabilised. 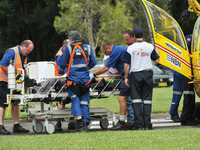 “They were airlifted to Coffs Harbour hospital suffering spinal injuries. 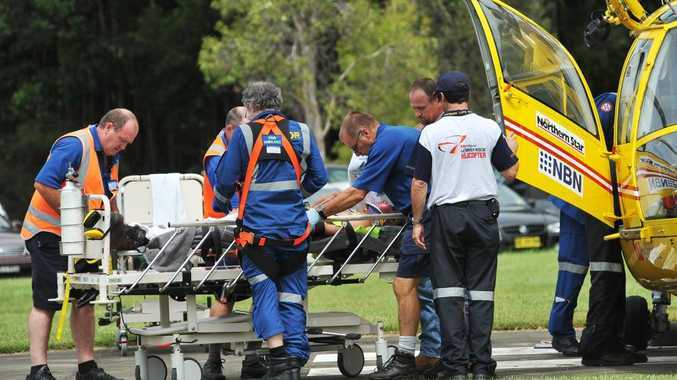 The men arrived at the emergency ward of the Coffs Harbour Health Campus about 12.40pm. Both were reported to be stable suffering head, chest and spinal injuries.